Her name is Anke and she lives with her family in Germany, in the hard to pronounce town of Oer-Erkenschwick that is near busier towns in the Ruhrarea. "It is not a beautiful town at first sight, but it is surrounded by a large forest and lots of green fields. It's not far from town but you can still have your peace and enjoy nature." Anke chose the area to raise her daughters where they could be safe. Children are an important theme in her life. She's a child care worker, a remedial teacher and works with The Prague Programme for Parents and Children (PEKIP). Around the time she had her daughters in the early and mid 90's, that was the time when she started sewing. "My mother thought I would need a sewing machine when I had children and she bought me one." Before that, Anke liked to knit, stitch and she tried lots of crafting techniques. When she started to sew clothing for her daughters, that was when she discovered a new world of wonderful and colorful fabrics. Although she would create fabric dolls for her daughters, which they loved dearly, she herself hadn't cared much for dolls growing up. Her favorite toy and trustworthy companion was a flat, bottle-green teddy bear. During a holiday in Italy with her parents when Anke was younger, tragedy stuck and her beloved green bear was lost. "After an hour or so of driving, I noticed that my teddy wasn't with me anymore. I missed my best friend so much." Her mother tried to contact customs to find the bear, but they got no answer. "No other teddy bear could replace that one." But her love of teddy bears remained. When a neighbor showed Anke a bear she had made, Anke thought it was nice but wasn't really touched. 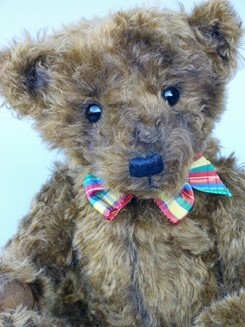 I thought bear making wouldn't be something for me. It must have been at that exact point when the bear bug bit her, but she just really did not know it." She bought a teddy bear magazine for her neighbor and ended up reading it herself. 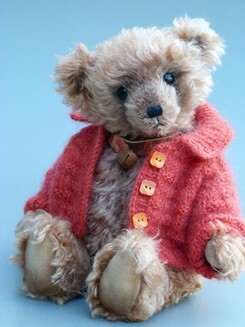 "There were lovely contemporary artist bears and I adored them very much. There was even an address of a bear making club in my town!" Anke joined the club. She found lovely people and made good friends while in the class. She made her first bear a month later. Her children and family loved her bears; even the odd ones she made from her own first patterns. 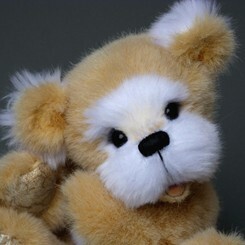 "I went on and on and visited the "Teddycollege," an online teddy bear making school of a famous German artist." That was when she really became addicted and decided to start selling her bears. 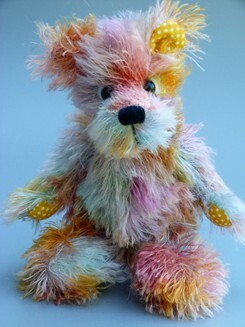 Her first bears were contemporary with big noses and big paw pads, often made from colorful mohair and faux fur. Anke experimented with various fabrics, played with different pattern proportions and sewing techniques. 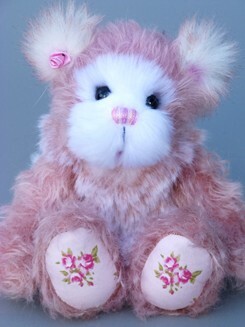 She tried stitching different noses, played with open mouth designs, sculpted and Trapunto techniques and started to hand dye her own mohair. 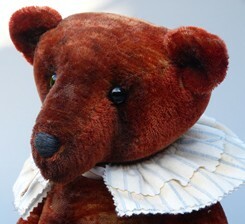 "My contemporary bears are still very near to my children's theme; they are like little children. And like little children, they have their own personalities, not one is the same." From this perspective, she developed her business name 'Bearsonalities by Anke Komorowski.' Since then she has entered competitions, winning first place in The Ted Worldwide in 2008 and second place in 2009. Although she's done very well in many competitions, she doesn't enter very many now, "I'm too busy with my bear business at the moment." 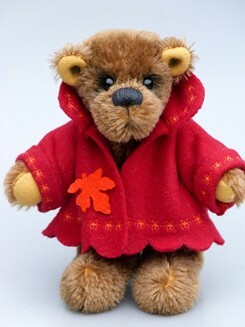 In the last few years, she started creating some traditional bears. "They are my sensitive and honest bears which want to be loyal partners for a lifetime with you." She's also working as a teddy doctor and started to learn airbrushing as well, which she uses to create bear T-shirts for collectors to wear. 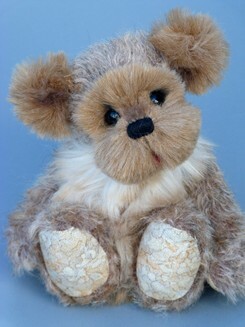 Anke sells her bears at online shows, at bear fairs (accompanied by her sister Ingrid), on her website and through Etsy. "I love what I do and I'm grateful that the bear making bug found me. 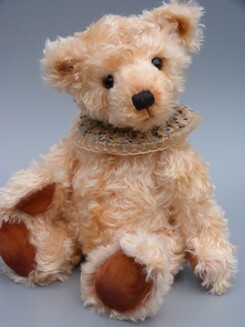 I met a lot of lovely collectors and other bear artists during the years and it's always amazing that teddy bears are able to find special people. I often have the feeling that the bears choose exactly the right persons for them." "If anybody has found a flat green teddy bear, similar to a Mister Bean teddy bear, wearing a Bavarian girl's dress at the border between Austria and Italy in June 1971, please send it to me." In the meantime, she'll keep creating bears of her own because Anke learned a long time ago, that a life with bears is a happy life.